Sorry that this post is a little overdue, we’ve been moving around a lot lately and have been short of time. Our plans changed a lot in Mark’s last week. Originally we intended to work our way up from Cusco to Quito, the capital of Ecuador and Mark’s departure point. We were behind on schedule already, and the trip up would already have been rushed, when we discovered the outrageous prices of flights from Quito to Northern Argentina, our next destination. Mark’s flight was from Quito to LA, with a stop over for a night in Lima. We all agreed that it would make a lot more sense for him to cancel the first leg from Quito, and hop on his second plane at Lima. Sounds easy enough, right? The airlines didn’t agree. This might be old news to those of you who’ve been round the airline-policies block, but it is impossible under any circumstances to cancel one leg of a flight without forfeiting the entire ticket. The cheapest option was to buy a return ticket with another airline Lima to Quito (via Bogota), so that Mark could catch a flight he did not want to be on from Quito back to Lima to stay a whole night where he started, and then travel onwards. Obviously he didn’t use the return end of this new ticket, but (again bizarrely) the price for a return ticket was half that of an identical one way fare. It was an expensive and mystifying encounter with airline logic. As for us, we found some good flights from Cusco to Asuncion, the capital of Paraguay, a mere few hours in a bus from Iguazu falls, our next stop. The only downside was that, as Australians, we need a visa for Paraguay from the embassy in Lima. On the way to Lima we stopped at a little resort town called Huacachina. 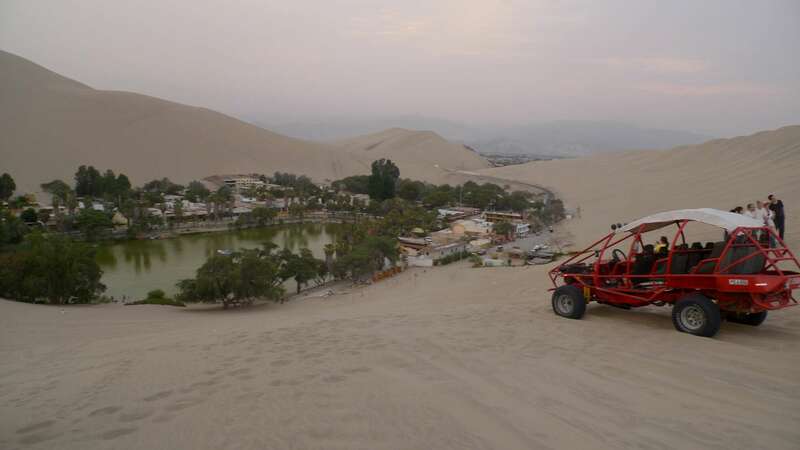 The town is built around an oasis, complete with palm trees, in the middle of the highest sand dunes in the world (they reach up to 2200m!). Apart from lying around a hostel pool – definitely not all bad – there is only one thing to do in Huacachina: sand boarding. So that is what we did! At five o’clock a smiling, jolly man picked us up and loaded us into this contraption. 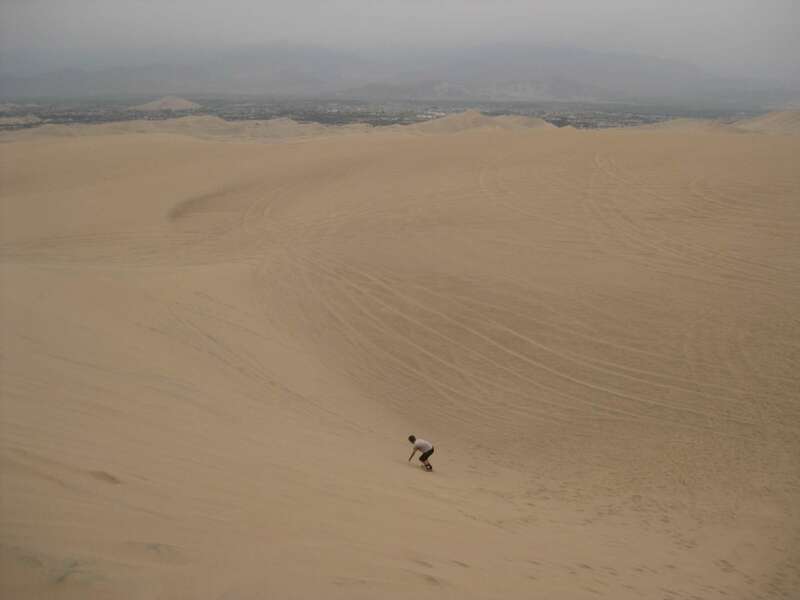 He took us on this crazy ride up, over and around the dunes. It felt just a like a cross between a roller coaster ride, and a hot wheels playstation game I used to play as a kid. He’d make figure of eights in the side of a dune, or ride up, up, up towards a crest until the Swedish girls behind us would scream “no! No! Stop!”, and chuckling he would send us plummeting down the other side, apparently towards a crop of rocks which he would swerve to avoid at the last possible second. It was exhilarating! The ride lasted for about half an hour before the sand boarding began. I volunteered to be first up. The guide laid me down on the board, demonstrated to everybody where to put the hands, and with no warning at all pushed me off and sent me flying down the dune. Great fun! We tried a few more dunes where we had the option of either lying down, or standing up and zigzagging down. Though for the final dune the guide was very clear that we should only stand up if we wanted to go to the “cementario”, that thing was huge! After Huacachina we headed to Lima for our visas. We didn’t have very high hopes for Lima, we’d heard from a few people that it was boring, and though its by no means the most interesting tourist city in South America, we really enjoyed it. We stayed in this very wealthy area called Miraflores which reminded me of New Farm in Brisbane. It was safe and lovely, with lots of beautiful cafes and wide streets lined with poincianas and expensive cars. Lima is also renowned for its Japanese food, which we treated ourselves to several times, including one memorable trip to an all you can eat sushi bar. It was nice to take a few days out for eating fabulous food and going to the cinema before we all parted ways. We sent Mark off on his lima-bogota-quito-lima circuit, and we headed for Paraguay, but that’s a story for another blog. great to get another blog. Sandboarding sounds and looks like fun.